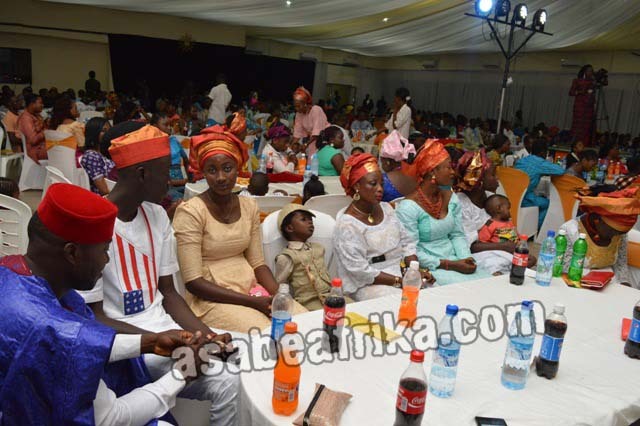 It was the first Sunday after Nigeria’s 56th Year anniversary of Saturday, October 1st 2016. Sunday, October 2nd, 2016, seemed to express how divinely genuine the last stanza of our national anthem; ‘One Nation bound in Freedom, Peace and Unity’ is; as tall, handsome and ebony colored Kayode Ogunyade, an ICT guru from Abeokuta, Ogun State, (South Western Nigeria) took his heartthrob, Ngozi Peace Daniel of Mbatoili LGA area of Imo State (South Eastern Nigeria) before Reverend Fidelis Ayemoba and a cream of other ministers of uGod at Omega Fire Ministries, on plot 8, Jubilee/CMD Road, Magodo GRA, Lagos. 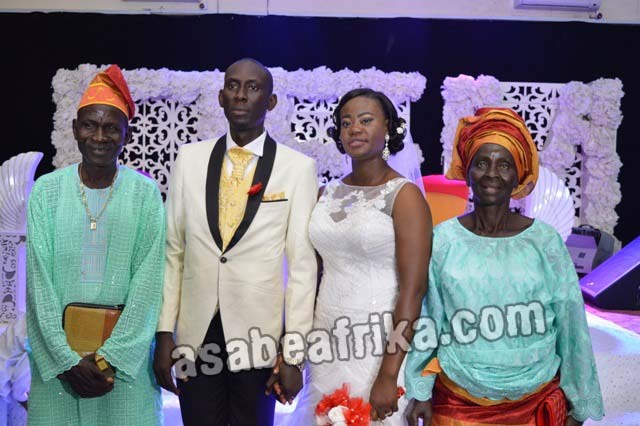 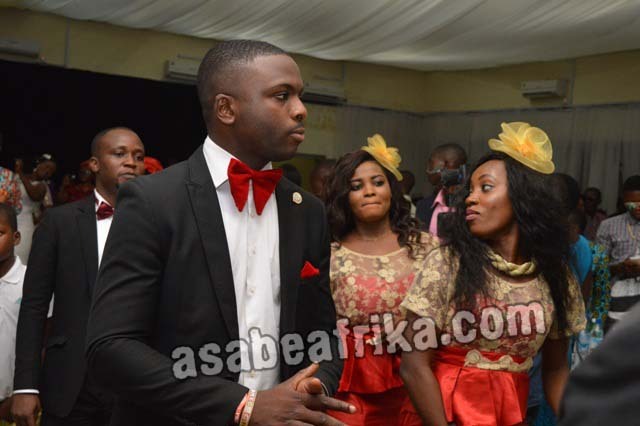 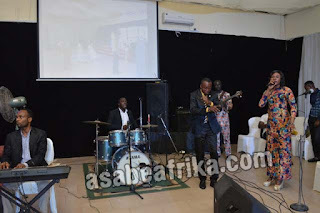 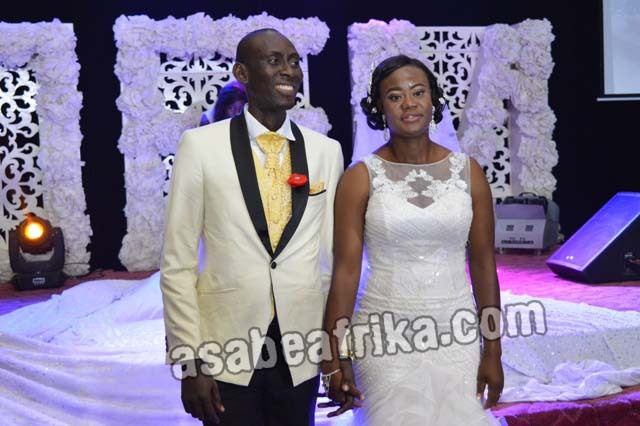 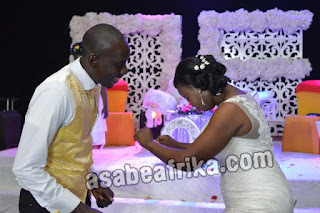 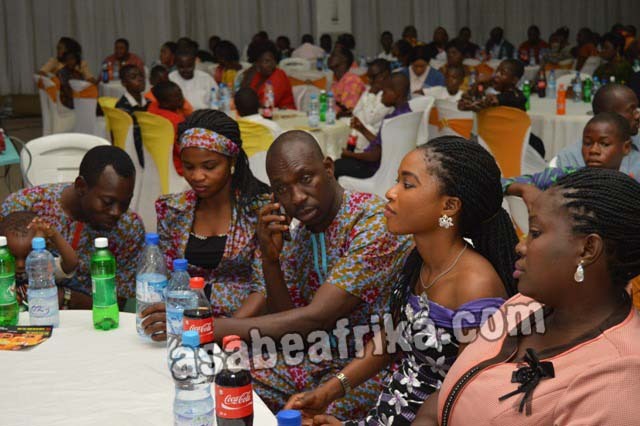 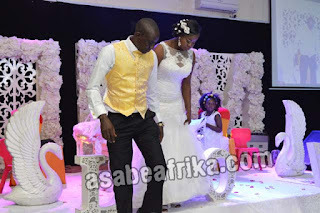 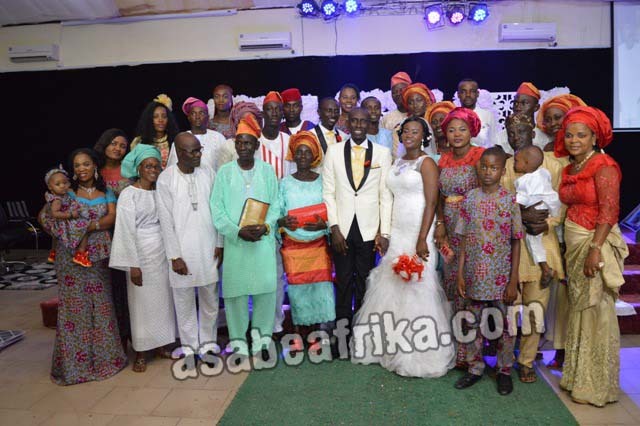 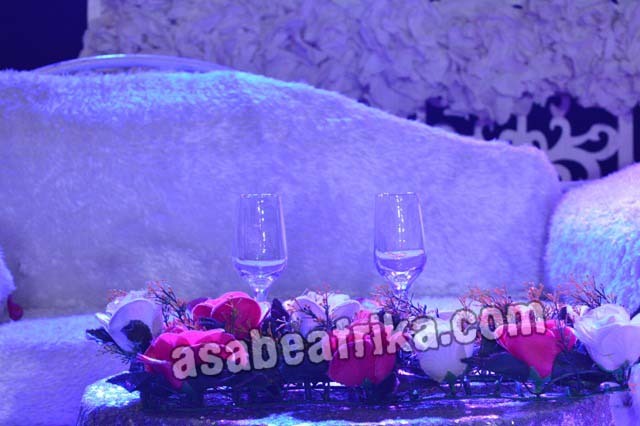 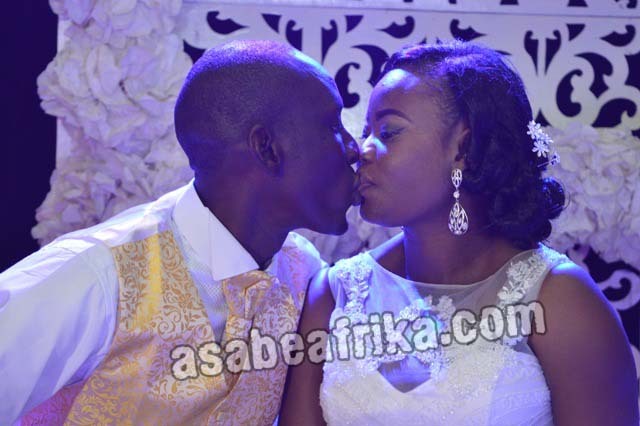 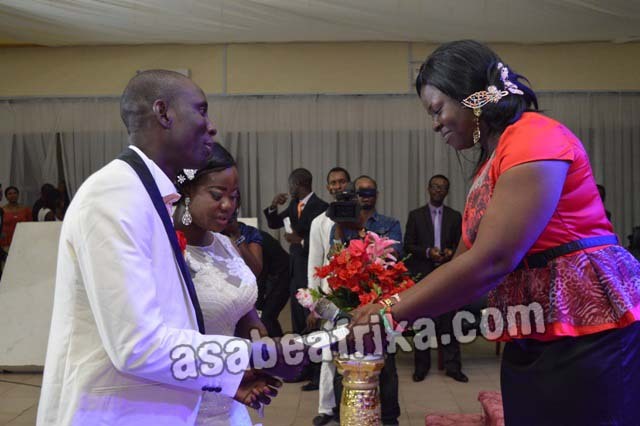 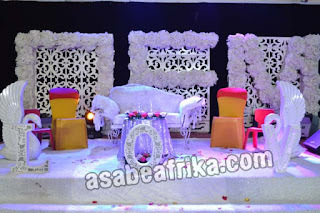 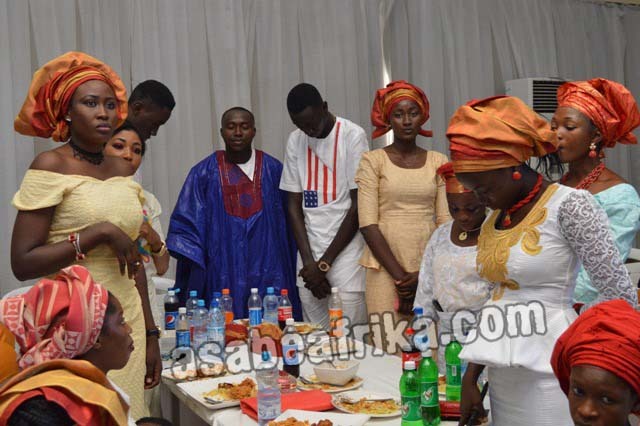 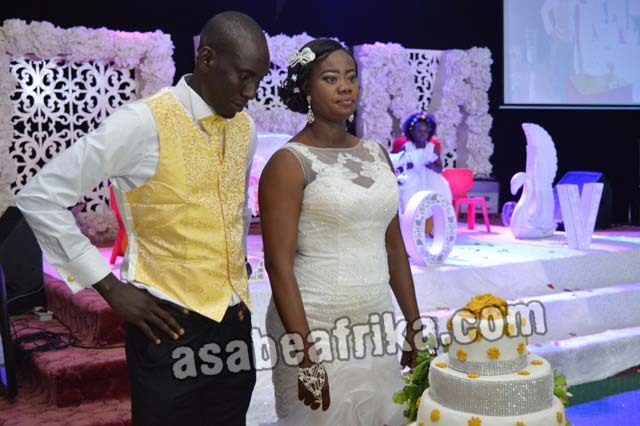 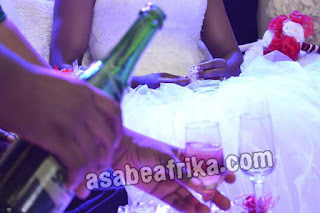 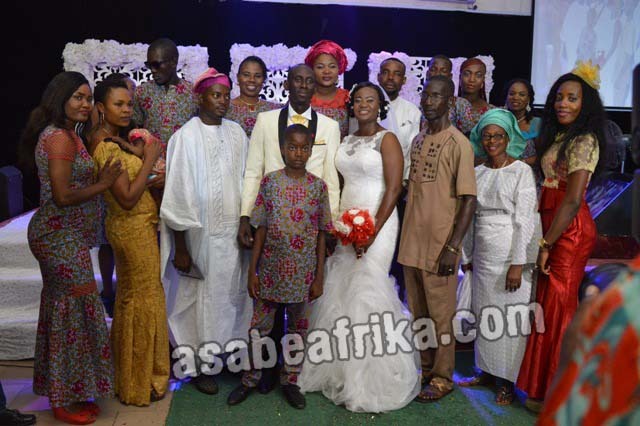 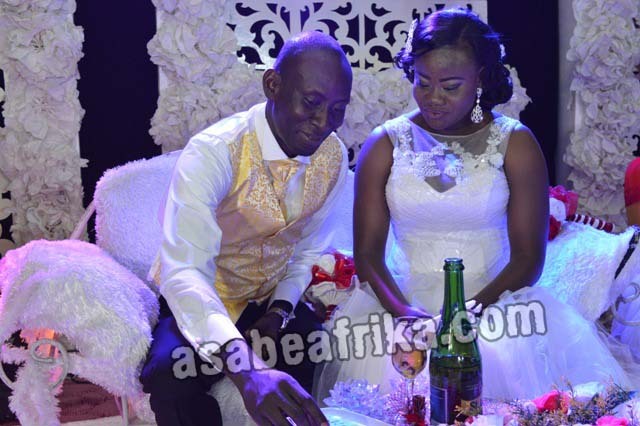 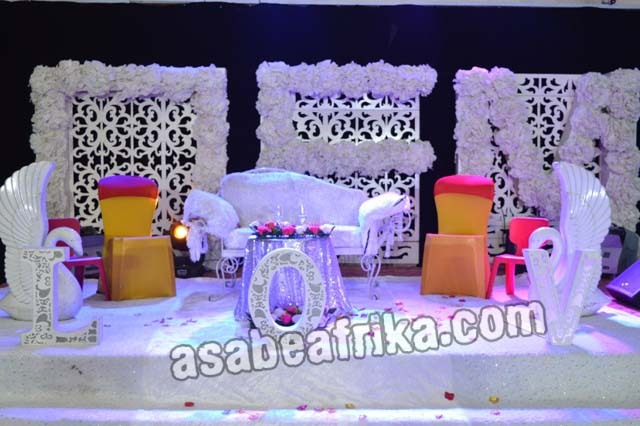 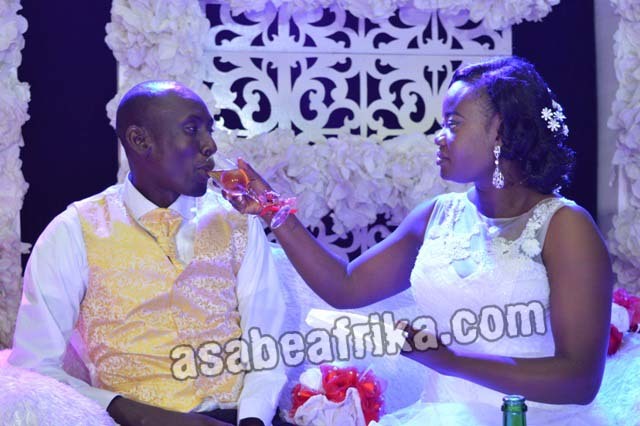 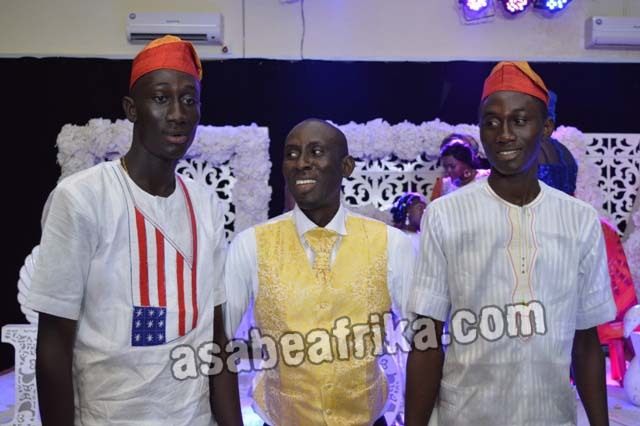 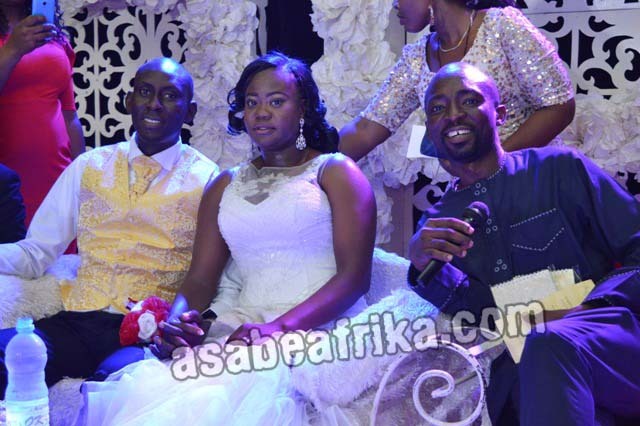 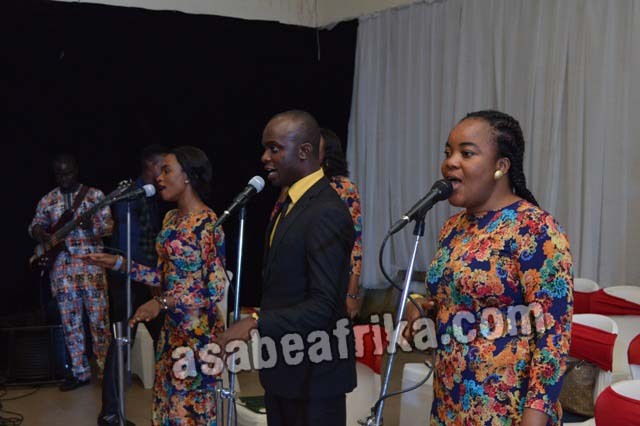 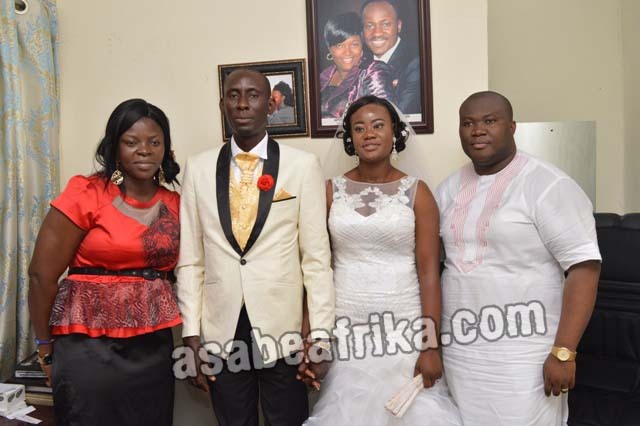 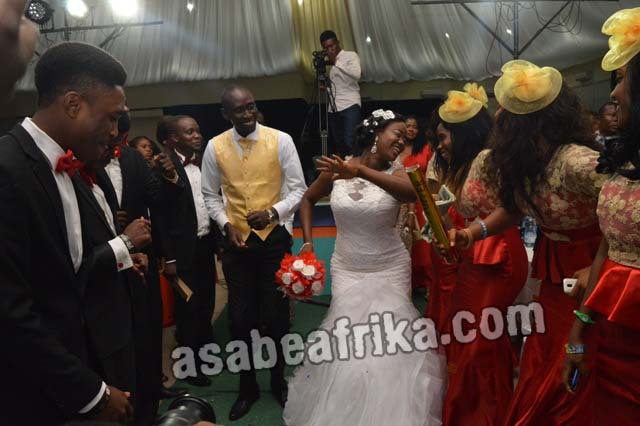 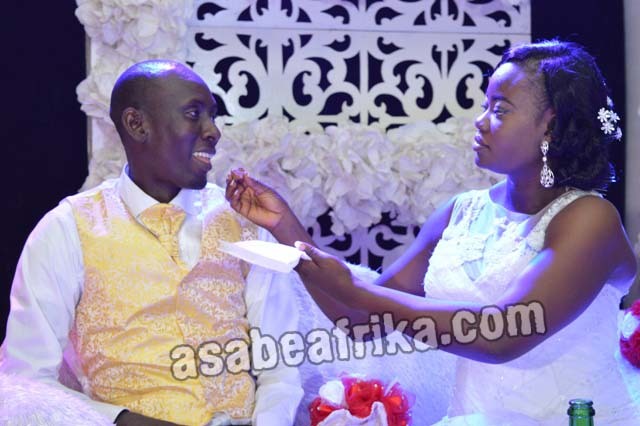 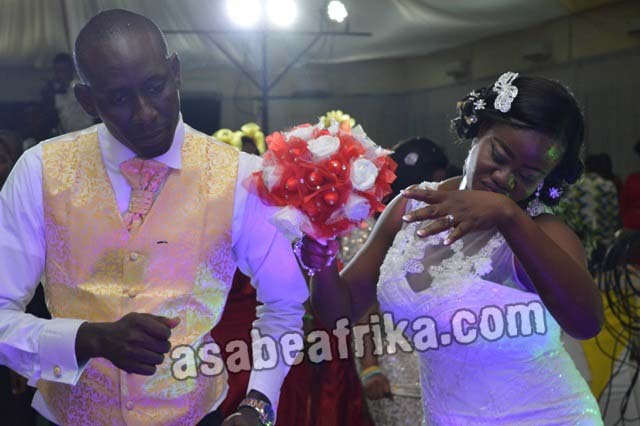 For Asabeafrika, it was the first wedding event after Nigeria’s 56th independence anniversary. 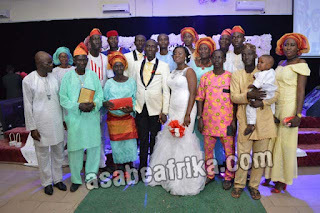 And it was a colorful one as well. 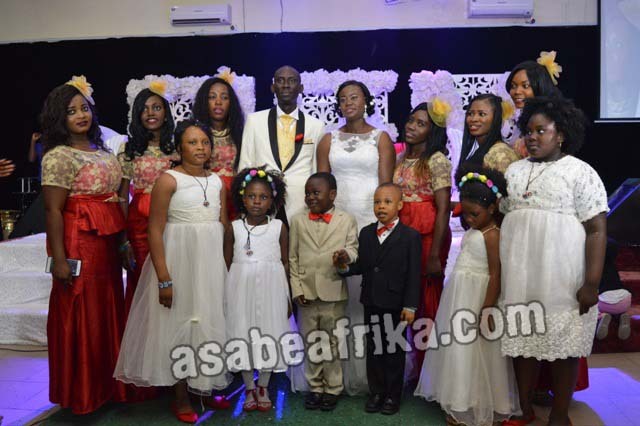 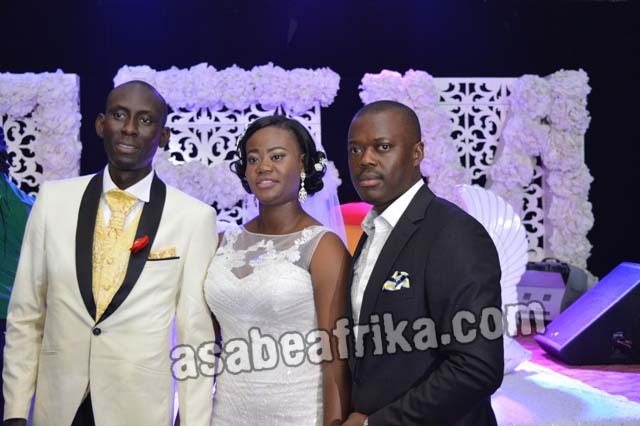 Family, friends and well wishers of the couple who turned up to join church members for the White Wedding ceremony were impeccably dressed in the best of English and native attires. 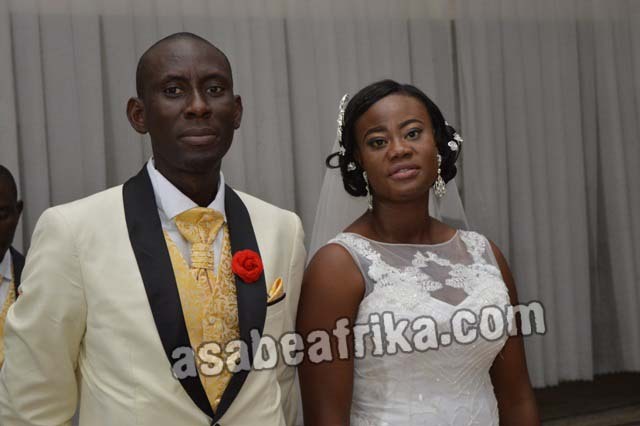 Ngozi whose name means ‘Blessing’ in her native Ibo language and Kayode whose name means ‘Bringer of Joy’ in his native Yoruba language met five years ago at a Lagos based newspaper firm where both worked at the ICT department and on Sunday October 2nd, the two broke their cultural barrier as they agreed to live in freedom, peace and unity as one flesh. 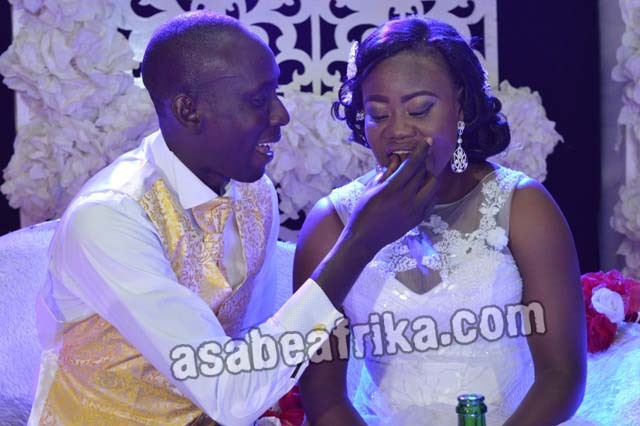 The groom is the son of late Pa Josiah Amao Ogunyade an Owu, Abeokuta-Ogun state born administrator while the bride is the daughter of late Pa and Mrs. Robinson Daniel Ejiofor from Mbatoili LGA in Imo State. 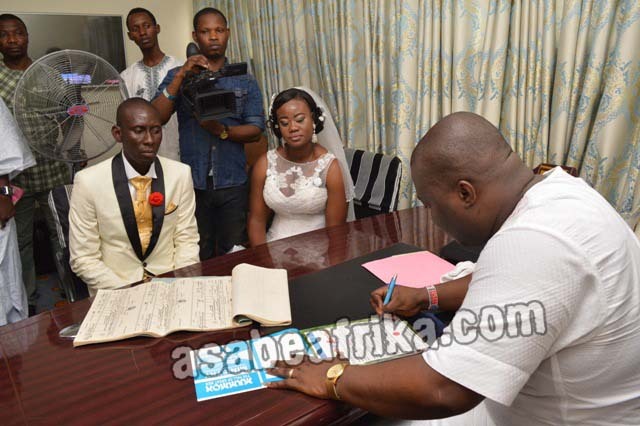 The exciting journey to marital bliss for the couple began with observing the traditional marriage rites at the bride’s hometown in Imo state two months earlier. 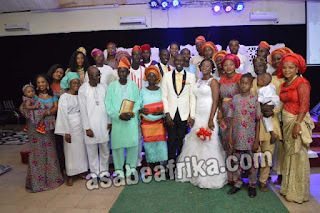 It was a colorful engagement ceremony done according to Ibo customs and tradition. The official church nuptial of Sunday October 2nd started at 8 am with opening prayers and song ministration from the very dynamic and ebullient choristers of Omega Fire Ministries, (Magodo-GRA, Lagos branch) under the ministration of the a dynamic minister of the gospel, Reverend Fidelis Ayemoba and a host of other anointed ministers of God. For the bride who is a member of the church’s chorister, it was a unique day as her colleagues immersed with joy and happiness for ‘Sister Ngozi’ saw the event as the best opportunity to show gratitude of giving one of their own a befitting ‘send-off’ celebration. The bride and groom later arrived (Entering of the Bride & Entering of the groom) in company of family & relations with the processional hymn ‘How great thou art’ being rendered by the choristers. 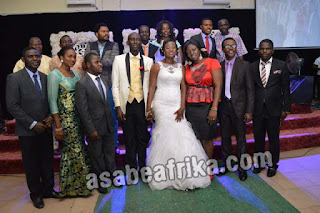 Other officiating ministers who joined Reverend Fidelis Ayemoba to bless the marital journey of Kayode and Ngozi are Pastor and Pastor (Mrs.) Julius Otoikhiam, Pastor & Pastor (Mrs.) Ifeanyi Ofienbor, Pastor and Pastor (Mrs.) Bright Edobor, Pastor Israel Igbinosa, Pastor Ossy Omenai, Pastor Martin Okonkwo, Pastor Nobert Ayemoba, Pastor Isaiah Moses and Pastor Ezekiel Obutse. 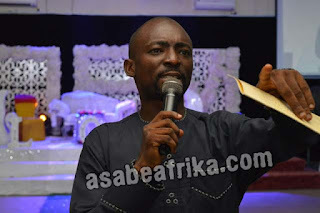 Giving his word of exhortation, Reverend Ayemoba described the institution of marriage as one sanctified by God Almighty from the foundation of the earth; the cleric noted that for Christian couples to enjoy the blessings of marriage, they must tap into the inner recesses of God’s divine promises through Genesis 2 verse 24 & Ephesians 5 verses 22 to 26 to take what belongs to them by faith as they are now in one accord. 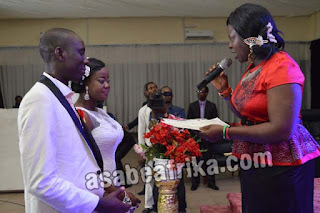 He enjoined the couple to follow through their new life path with a Christ like virtue. 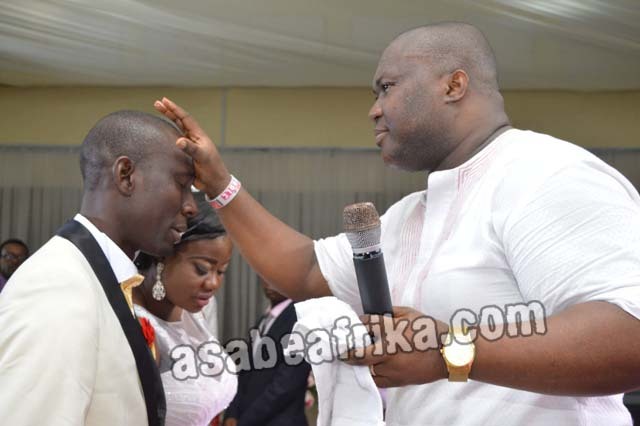 Ayemoba who based his major sermon on ‘prophetic inheritance’ illustrating it with the story of the troubled kingdom of David and the peaceful inheritance of King Solomon congratulated Kayode Ogunyade who is of the Glory Christian Ministries and equally a church worker like Ngozi (He works at the IT department of his church) for locating his bone of bones in the body of Christ. 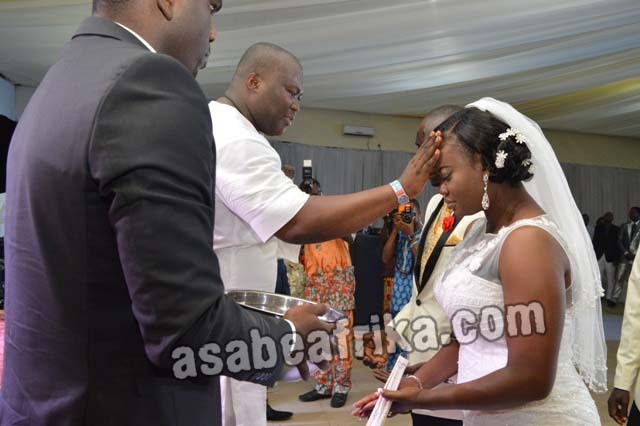 The Reverend urged the couple to live by nothing but the laws and standards of the Holy Bible. Ayemoba urged the groom, Kayode to love his bride, Ngozi unconditionally and that Ngozi should surrender and remain loyal to her husband in the entire course of the union. 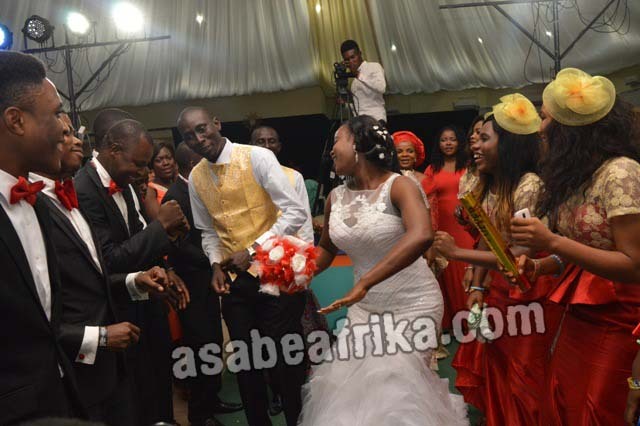 Kayode and Ngozi later took their marital vow before the congregation after the charge of declaration. 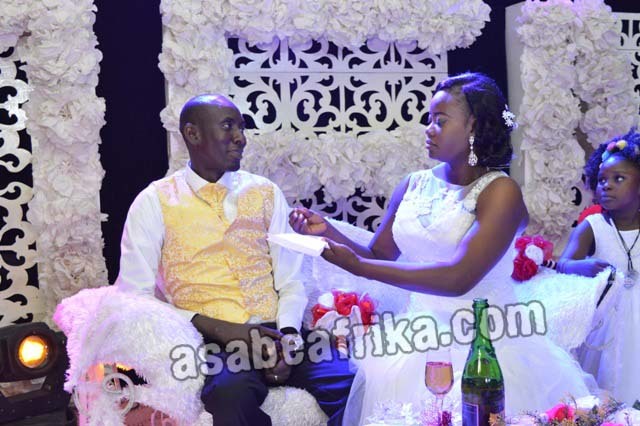 A prophetic declaration from ministers of God followed suit after Reverend Ayemoba administered the Holy Communion on the newly wedded couple. 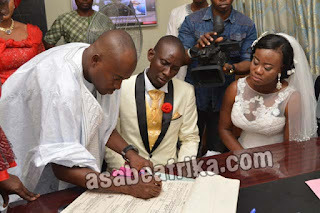 The next event was the signing of marriage register which took place inside the office of the pastor in the presence of selected members of the couple’s families. 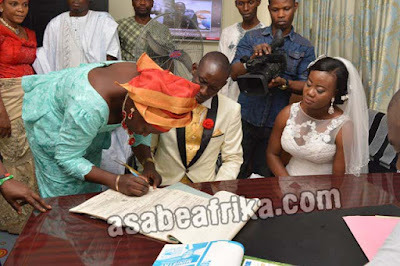 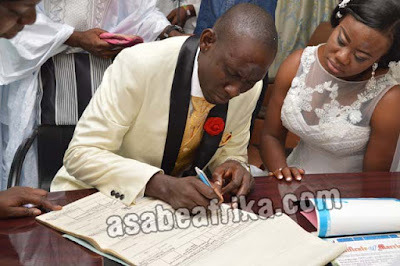 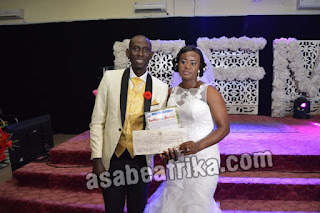 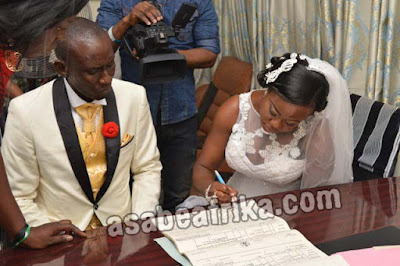 A marriage certificate was later issued to the newly wedded Mr. and Mrs. Kayode Ogunyade which was specially handed to them by Pastor Gladys Ayemoba, wife of the presiding Reverend Fidelis Ayemoba in the presence of the congregation. 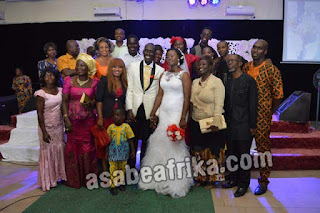 Some of the groom’s family members who attended the occasion are Madam Olukemi Ogunyade, groom’s mother. Others are groom’s uncle, Pa Tunde Ogunyade, elder sister Mrs. Funbi Ojelere, brothers Mr. Gabriel Ogunyade and Mr. Tope Oluwabiyi, an IT expert and Agric blogger. 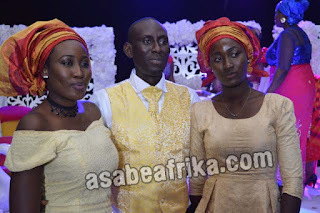 Another sister of the groom Mrs. Sola Suberu who was out of town sent her blessings to the couple. Bride’s uncle, Mr. Christian Onu led a delegation of families from Mbatoili to Lagos to witness the historic occasion. Kayode Ogunyade is a Technology Manager with leading Nigerian Public Relations Company, Media Craft while his beautiful wife, Ngozi is a marketing executive with GSM Company, Etisalat. 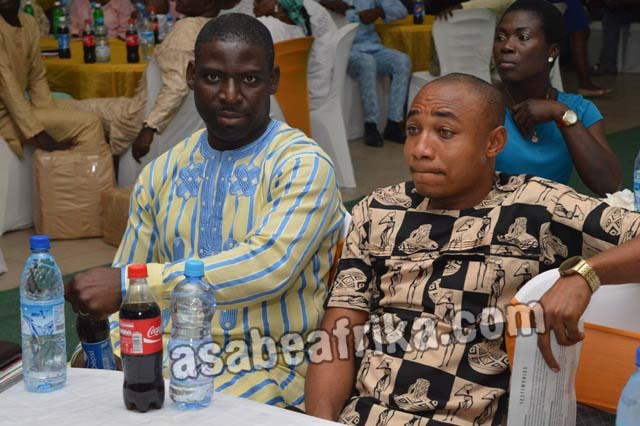 The two met six years ago at The Moment Newspaper, Lagos where they both shared responsibilities at the ICT department of the media establishment. 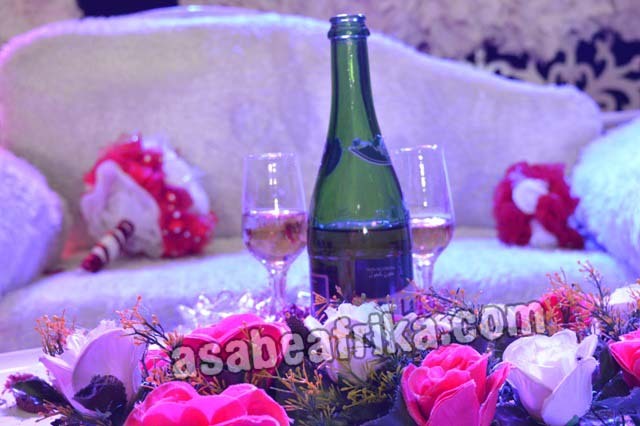 Both later found that they shared many things in common and that led to a courtship that culminated into marriage. 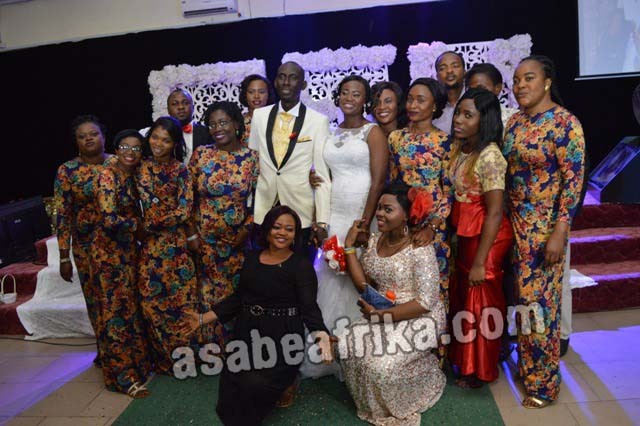 Their Marriage reception took place at the church’s recreational center with the presence of friends from all walks of life and relations who throng the venue from Imo and Ogun States respectively. 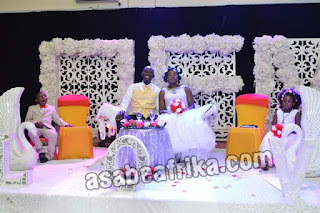 Speaking on how Kayode and Ngozi met, Gbenga Olajobi, head of Photography department, Babcock University, Ilisan-Remo-Ogun State, who equally worked at The Moment Newspaper with the couple as Photo Editor 6 years ago, described the marriage of Kayode and Ngozi as a ‘Unique Miracle’. 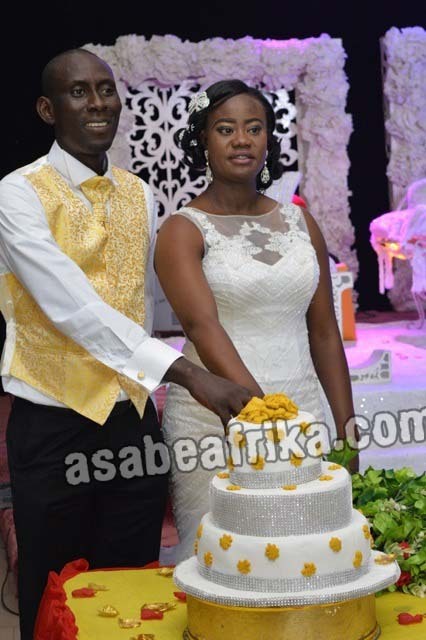 Olajobi noted that not many people saw it coming ‘I think Kay (As Kayode is fondly addressed by friends) is a lucky husband and Ngozi is equally a lucky wife. We never knew the two could come together to be lovers talk less of becoming a couple. 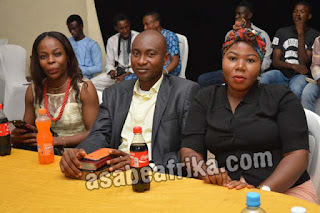 Like it is in some work environments in this part of the world, Ngozi was under pressure from other quarters in our office at that material time but she maintained her decency and sanity.  Very cool headed, easy going and hardworking. However, the big puzzle was the fact that we didn’t know Kay was the lucky man. It never showed, it was later we all got to know but the secrecy was quite profound. 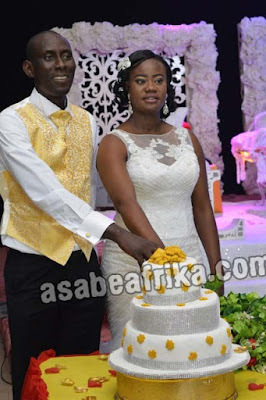 It was indeed a meticulous affair and for them taking it this far, I can only congratulate and wish them many more years of blissful experience, happiness, lovely children and other achievements of life. 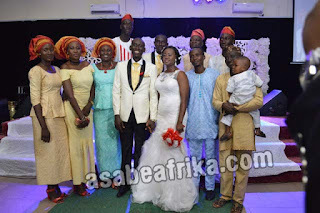 I am happy for Kayode and Ngozi” concluded Gbenga Olajobi who spoke to Asabeafrika on phone as he could not make it down to the event to give his toast due to pressing engagements elsewhere. 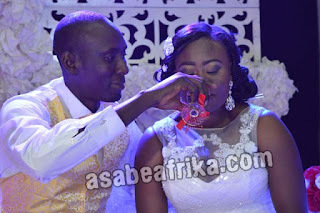 Victor Bassey an ex-staff of Media Craft who has worked with the groom in two other organizations (Business Hallmark Newspaper and Media Craft) described the groom like this; “What can I say about Kayode? I will say he is an honest guy, honest to a fault. 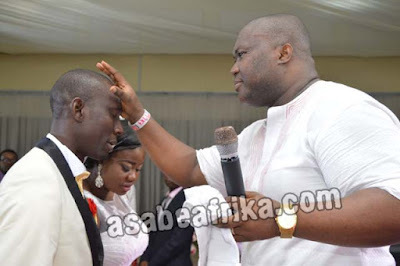 He is indeed honest and very sincere. 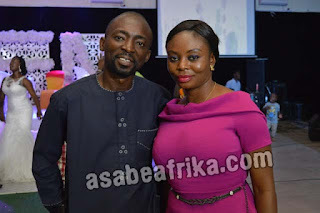 His type is very rare to come by and that is why I strongly believe that Ngozi made the right choice in having him as her life partner. I have worked with Kayode for many years and in two organizations for that matter; and I have never heard any negative comment from him or about him. 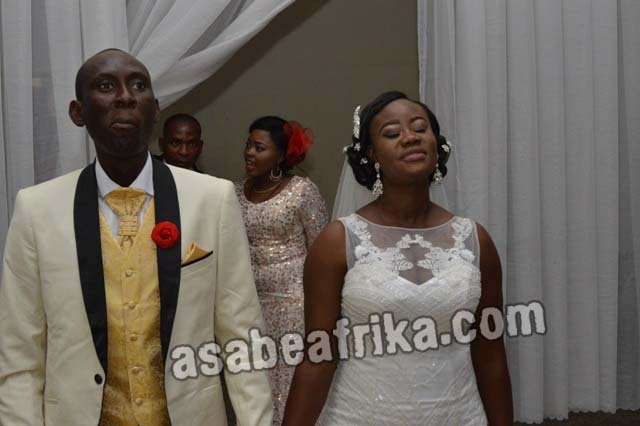 I congratulate Ngozi for being lucky to have him as her life partner”. 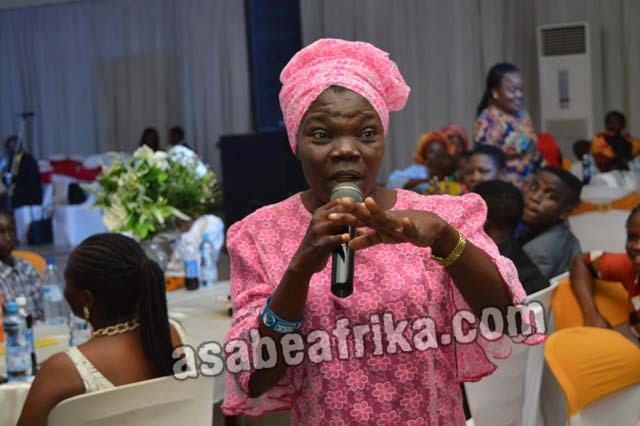 In her own submission to Asabeafrika, Mrs. Immaculate Chinyere Uzoma a relative of the bride from Imo State described the bride as ‘a complete gift of marriage’ hear her speak “Our daughter is a blessed daughter, Ngozi can cook good meals, she can wash clothes, she can take care of the home and she will take care of the incoming kids. She is what I call complete package because she is very hospitable” Mrs. Immaculate declared to the admiration of the crowd who rendered clap offerings at the reception. 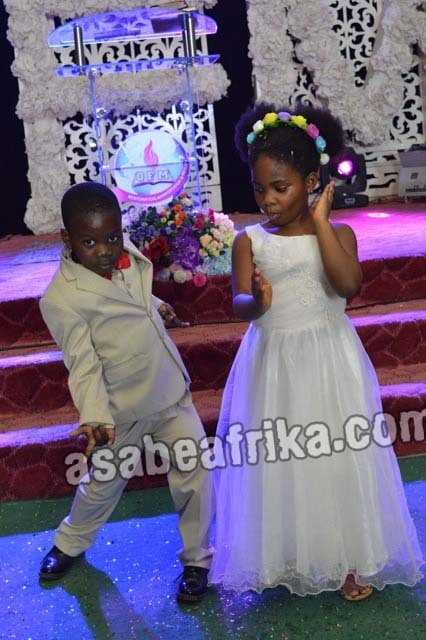 The wedding reception which saw the couple dancing majestically into the hall with bride’s maids, best men and best ladies was spiced with various segments like special music ministration by the OFM Magodo choir. 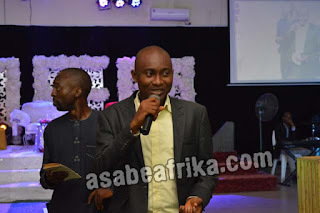 The opening prayer was conducted by Mr. Femi Attah of Glory Christian Ministries while opening remark was given by the Chairman of the occasion, Pastor Olasupo Ojo of Adonai Prayer & Miracle Ministry. Pastor Olasupo Ojo while giving his remarks urged the newly wedded couple not to ever deviate from the real manual of a successful marriage which is the Holy Bible as that is the only manual needed for them to live a greater life of joy and happiness. 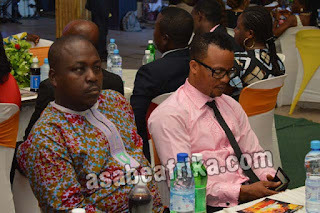 Some representatives of the founder of Glory Christian Ministries, Pastor (Dr.) I. S. James, in the person of Pastor Ronald King and Apostle Mike Eko were also in attendance. In their characteristic of love and unity, several branches of the Apostle (Dr.) Johnson Suleiman led Omega Fire Ministries like OFM Ikeja/Magodo family, OFM Women council, OFM Men council, OFM Youths extended families, and OFM Central Youth graced Kayode and Ngozi’s nuptial. Likewise families of the groom’s church like GCM Ikotun family point, GCM Infotech Department and Glorylanders were in attendance. Members of Winners Chapel equally attended with many of them bringing wedding gifts to the couple. 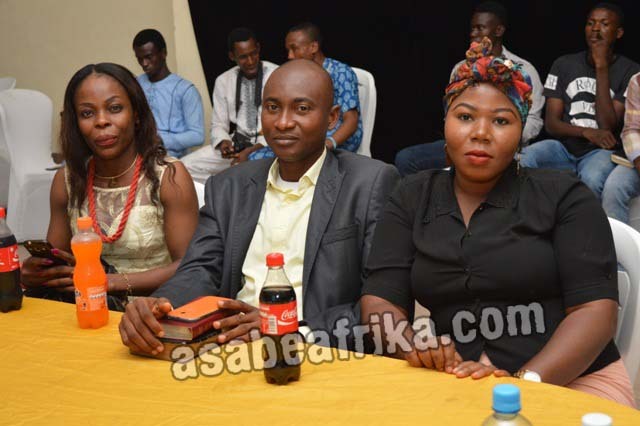 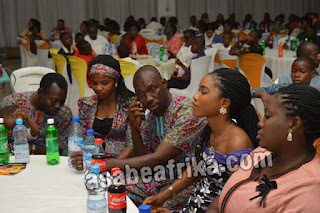 Some Executives of Media craft Ltd (Martha Okpeke, Victoria Bassey, Seun Igbalode, Andrew Ajileye and Jerry Ehiguese) were in attendance likewise executives of Etisalat. 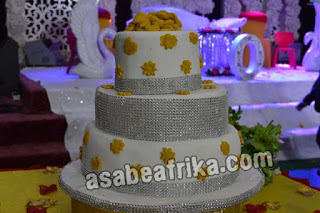 The cutting of cake was directed by bride’s uncle Mr. Christian Onu while this blogger directed the affairs of the event as MC. 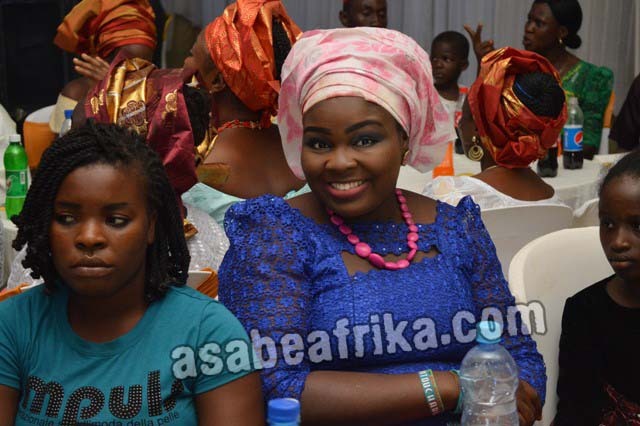 Closing Prayer was delivered by Deaconess Roseline Ositadinma of Redeemed Christian Church of God. Asabeafrika wishes Mr. & Mrs. Kayode Ogunyade a blissful marriage. Amen.